St Nicholas church dates to the middle of the 13th century, but most of the current building is a result of a major rebuilding in the late 15th century. Only a part of the west end and tower survives from the earlier church. The church consists of a west tower, a combined nave and chancel, north and south aisles, north and south porches, and a vestry on the north side. 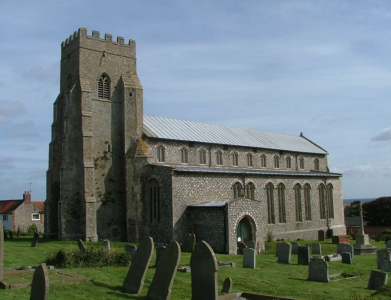 Some historians think there were actually two previous churches at Salthouse, perhaps a Norman building, now lost, to the north of the current building. 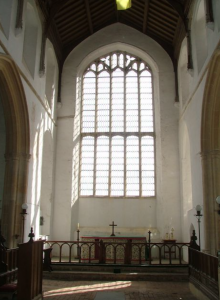 It seems certain that the current church dates to about 1500 and was carried out under the patronage of Sir Henry Heydon of Baconsthorpe Castle, probably using tworkmen who also worked on the castle. Construction was finished in 1503. The church stands on a hill, offering wonderful views along the coast and out to sea. The interior features a beautifully carved 15th century lion font. Look for the figures of very appealing, cheerfully cute lions supporting the pedestal base of the font. 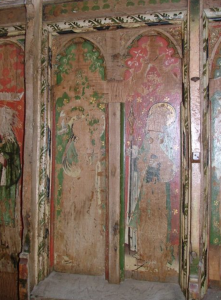 Above the lions are a series of panels, perhaps recut, featuring symbols of the 4 Evangelists, with the Instruments of the Passion and a Tudor rose. Information courtesy of Britain Express.